Dr. Christine Blasey heads Stanford University’s CIA Undergraduate Internship Program. She is accusing Supreme Court nominee Judge Brett Kavanaugh of misconduct. The Senate votes on Wednesday on whether or not Kavanaugh should be confirmed to serve as a Justice on the Supreme Court. Dr. Blasey is listed as an affiliate at Stanford University in the Psychiatry and Behavioral Sciences. In the same hometown paper, a Letter to the Editor about Judge Kavanaugh was “PUBLISHED” on Sept. 19th, 2014. It was “UPDATED” four years later on Sept. 18, 2018. 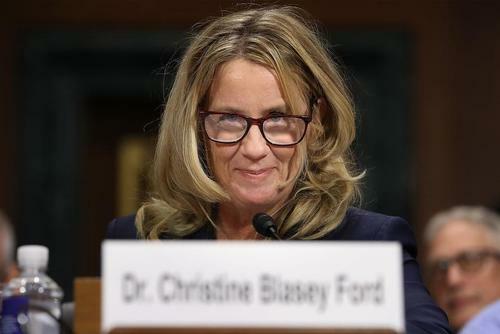 Christine Blasey’s brother used to work for the international law firm of Baker, Hostetler. The firm created Fusion GPS. The Observer-Reporter, Washington, Pa., dated Nov. 19th, 1985, Page C-3. This entry was posted in Government and tagged Brett Kavanaugh, Christine Blasey, Supreme Court on September 23, 2018 by Bone Fish. Send photo of her passed out to every congressman and woman!